Enter the high tech Truss expo world for Under Five Thousand Dollars! 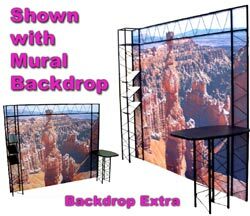 Stylish design gives your Truss Displays the cutting edge image. Sturdy and stylish, the Mars Truss Display has many nice features and benefits. 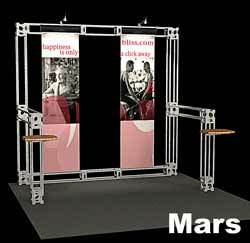 Mars Truss Display - 10' x 10' kit. Also available: Hanging Retractable Banners. $2600.00 Manufacturers Suggested Retail Price. Truss Trade Show graphics and backdrop not included. Trade Show Truss Frame in Closed Position. Pull to Open. Trade Show Truss Displays come in Kits or you may configure your own design. Truss Displays may be combined for a 20ft Trade Show Exhibit.